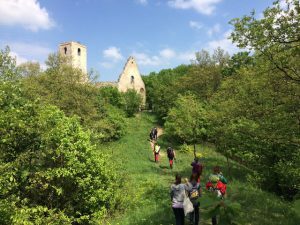 On Sunday, April 23, 2017, more than 100 people walked during the White Sunday pilgrimage to Katarínka monastery. 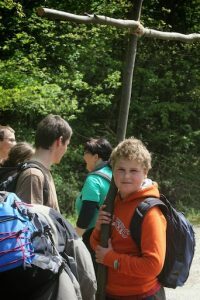 The whole event started at the Buková railway station and people wandered through the woods of the Small Carpathian mountains up to Katarínka. n the ruins of the church and monastery of St. Catherine of Alexandria mass was held at 14 o’clock. It was attended by about 250 visitors. 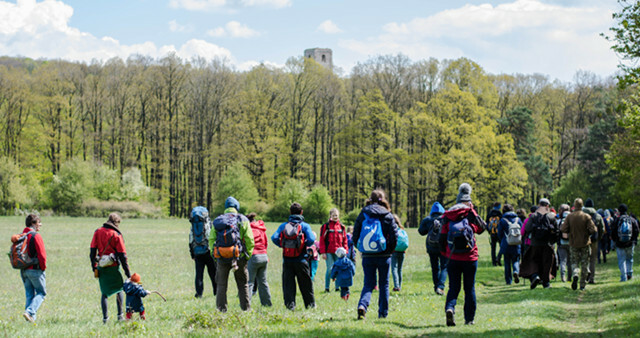 Even despite the cold weather and the wind that accompanied the whole pilgrimage, many enthusiasts came, among whom were adults, children, and also the older generation. 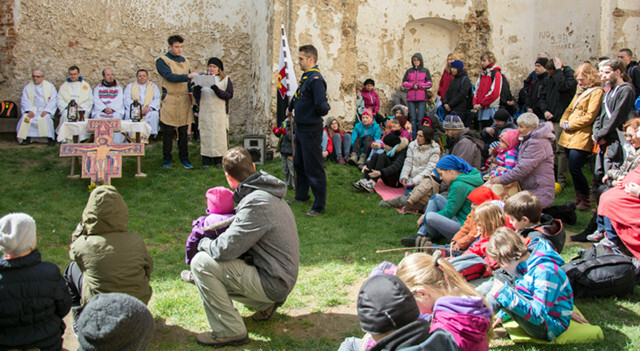 The service was celebrated by the Franciscan Felix M. and the priests concelebrated, Mário B., Miroslav K. from near Dechtice and the Jesuits Martin H. and Ladislav Š.. After the service volunteers were accompanying visitors of Katarínka with their historical interpretation. 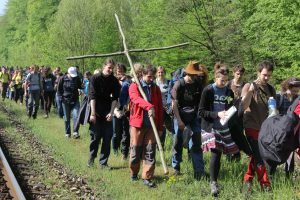 The last April Sunday (27/04/2014) was dedicated to “Bielonedeľná púť”, the traditional one-day pilgrimage to Katarínka on the first Saturday after Easter. 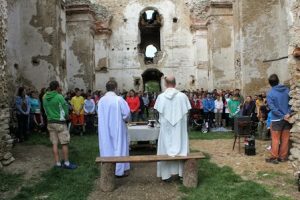 The pilgrimage was attended by approximately 140 pilgrims, and about 280 people took part in the following Holy Mass. This day’s mass turned out to be a celebration of both the canonization of John XXIII. and John Paul II. as well as the feast of the Divine Mercy Sunday, which is also called the “White Sunday”, of which the name of the pilgrimage is derived. The track of the pilgrimage started traditionally at the railway station Buková, from where it continued across Raková and up the forest trail straight to Katarínka. The pilgrimage was accompanied by short stops with reflections which recalled the meaning of the pilgrimage. The sunny weather, which lasted until the very end, created an agreeable atmosphere throughout the journey. The Sunday Mass in the ruins of St. Catherine’s Church was celebrated by Branislav “Beren” Popelka, the administrator of the parish of Majcichov. The sermon was delivered by Vladimír Bartolomej Hurňanský (in the picture, distributing the holy communion), a dominican priest and administrator of UPC Zvolen. After the mass, an opportunity arose to have a barbecue, to show the visitors the results of the work and the plans of the volunteers that help here over the summer. Some people were also interested in a guided tour telling the history of this place. It was the 15th pilgrimage from the time of its modern dating. 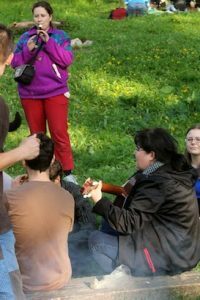 We were pleased by the biggest turnout so far – probably also thanks to the favourable weather, although it is generally hard to predict weather in April.